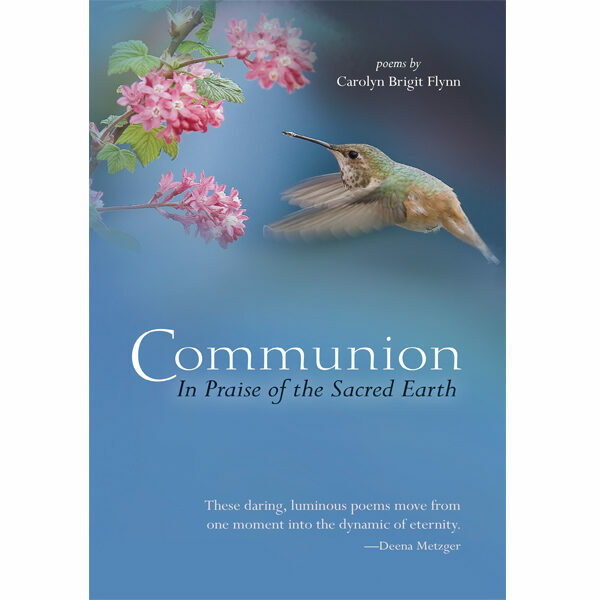 Communion is Carolyn Brigit Flynn’s offering of love poems to the sacred Earth, addressed in these poems as Beloved. The poems invoke the author’s movement from an urban Catholic childhood into an embodied communion with the sacred presence of the Earth. Inspired by Rainer Maria Rilke’s Book of Hours, each poem uses one of Rilke’s lines as its title and springboard. Communion addresses timeless issues of spiritual awakening, loss and communion, and moves the reader through longing and moments of spiritual aloneness into a vivid connection with the sacred Beloved that is resilient and integrated into the rhythms of daily life. Many of these magnificent poems made me weep with joy… Spirit called. The poet answered. What emerged? Communion. The heart is well in these poems. They are full of deep glad love, honest yearning–and yes, communion. They live up to their title. A beautiful book. These are very, very fine poems. It is a little miracle to have someone else giving birth to that intangible burst of light where we find ourselves home, connected with the Oneness. Carolyn Brigit Flynn evokes the arc of mystery that runs along our capacity to perceive, to wonder, to participate and to surrender. Her poetic voice is distinctly feminine (strong with inwardness, reflection and sensuous image), as she brings her response to Rilke’s voice into the American idiom. Communion is a collection of modern psalms, and like the scriptural antecedent, these poems range over the full extent of human experience in relation to the sacred. The poet’s personal journey from traditional Catholicism to a more widely embracing communion of, and with, the spirit is very resonant with a great number of people today. The German poet Rilke’s work deserves to be better known by English readers, and this collection is a bridge to his poetry.